Approx. Weight: 8 lbs. 12 oz. Every cut of each steak in this Chicago Steak Sampler is upper-1/3 USDA Choice. Each steak is hand-selected and hand carved to ensure you get the best cut possible, and then dry- or wet-aged to intensify its naturally delicious flavor. That is why the Chicago Steak Sampler offers steaks that are among the most flavorful, juicy, and tender steaks you'll ever eat. 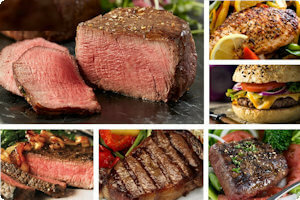 You can sample these amazing wet-aged steaks that are not too big, allowing you to keep your portion under control, while eating a steak you'll get at 5-star restaurant.